A while back, I became interested in some interesting properties of current sources and set out on a quest in LTSpice to see if these interesting little circuits could be used to advantage in RF circuits in lieu of the more typical resistor or inductor load, or as an RF choke to drive other circuits such as diode switches. In the process, I ended up developing a somewhat novel amplifier that has most of the advantages of the well-known push-pull RF amplifier but without transformers. This topology is undoubtedly known and used in other circles but, to the best of my knowledge, is not common in amateur radio circles. In this paper, I’ll describe the basic mechanisms of current sources and show how a very simple and easy to produce circuit using them can provide excellent amplifier performance for HF intermediate frequency/gain stages. Most of us know the terms “voltage source” and “current source”, but we seldom take time to think about the implications of their definition. A perfect voltage source is a device that can supply a given voltage no matter how much current the load it’s attached to draws. We could say that a voltage source’s ‘dynamic resistance’ is zero because E (voltage) doesn’t change as I (current) changes. Expressed mathematically, dR = dE/dI = 0 (where the ‘d’ symbol means ‘the change in’). Conversely, a “current source” is a device which supplies a constant current no matter what the voltage at its terminals is. A perfect current source’s dynamic resistance can be expressed by the same formula above and the result comes out to….infinity! Wow, this is pretty interesting! Imagine what you could do with a component that can supply a constant current with infinite impedance. You could directly drive diodes in an RF switch circuit. You could provide a DC return path in circuits that need a high AC impedance. Or you could use it in place of an RF choke in the collector of a transistor amplifier. A common JFET is a good example of a constant current source. If you connect the gate to the source and connect a variable voltage from source to drain, you’ll find that, once you get above a supply voltage of a couple volts, the current drawn by the FET levels out and doesn’t increase with increasing voltage. This is what’s commonly called the FET’s Idss current. Examples of current sources and current sinks that can be built with bipolar transistors are shown below. One day, I was experimenting in LTSpice with one of the applications described above; ie, trying to build an ‘active replacement’ for the typical resistor or inductor in the output of an amplifier. The advantage of using the current source here is that the high dynamic impedance of the current source allows DC current to flow into the amplifier while also allowing the amplifier to develop very high voltage gains. It works quite well, at least over the range of HF frequencies. At higher frequencies, stray capacitance inside and outside the active devices make high impedance circuits problematic. While playing around with this, it occurred to me that the driven device in the amplifier was actually acting as a ‘modulated’ current sink for the current source load. What would happen if you built the amplifier as a current source driving a current sink and modulated the currents of both stages with an RF drive signal? Well, it turns out to work very well, providing performance very similar to a traditional transformer push-pull amplifier including excellent linearity, cancellation of even-order products and good DC current efficiency. 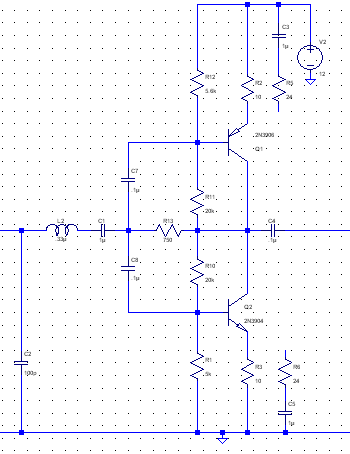 This is what I’m presenting below, called the “Transformerless Push-Pull Amplifier” (TPP). The version of the TPP amplifier below was intended for use in a transceiver bidirectional amplifier where the amplifier direction is changed with a pair of SPDT CMOS bus switches (schematic shown below). Desired characteristics included moderate flat gain over most of the HF range (15-20 db), good noise figure, ability to develop at least +10dbm for Tx mode, good linearity at high output levels and good DC power efficiency. The amp was implemented with a 2N3906 current source supplying a 2N3904current sink. The 2 stages meet at the collectors, which is the output. The bases of both stages are biased so that a voltage developed across their associated emitter resistors establishes the desired current through the amplifier. The RF input is capacitively coupled into the bases of both transistors. The operation of the amplifier can be visualized by assuming a sine wave signal at the input. As the signal voltage decreases, the top current source will ‘push’ more current into the output load while the bottom current sink will ‘pull’ less current from the load. The current in the load will continue to vary with the drive signal over the whole input AC cycle, the whole time with the top transistor pushing current and the bottom pulling current. When first built, the amp had no feedback and no impedance matching at L2 & C2 . The gain was about 24dB at 1 Mhz dropping to 20 db at 30 mhz. Adding the feedback resistor at R13 flattened out the gain to about 19 dB across the band with about 1.5 db variation. Input match was about 15db at the low end dropping to about 9 db at the high end. Output match was about 12 db over the range. Adding the LC matching network at the input increases the match to about 14-20 dB across the range. Adding the components at C3, R5, C5 & R6 produces several db of additional gain at the expense of having to re-optimize the matching. More work needs to be done in this area. Performance-wise, this amp is a winner. As shown, it draws about 19 ma on Rx, rising as you drive it harder in Tx mode. The noise figure is under 3db but the fully saturated RF output power is almost +20dbm (100 mw). The amp is very linear up to over 15 dbm, as is evidenced by the second harmonic of better then -45db at this level. All harmonics behave as classically expected of a push-pull amp, with odd-order products predominating. An unusual amplifier topology for HF receive IF and intermediate transmitter driver amplifier applications has been presented. It is easy to build with commonly available parts, has no transformers, and yet provides all the advantages of a traditional transformer-driven amplifier. Assuming availability of PNP/NPN pairs at higher frequencies and power levels, this amplifier might find application beyond low-intermediate frequency/power levels.